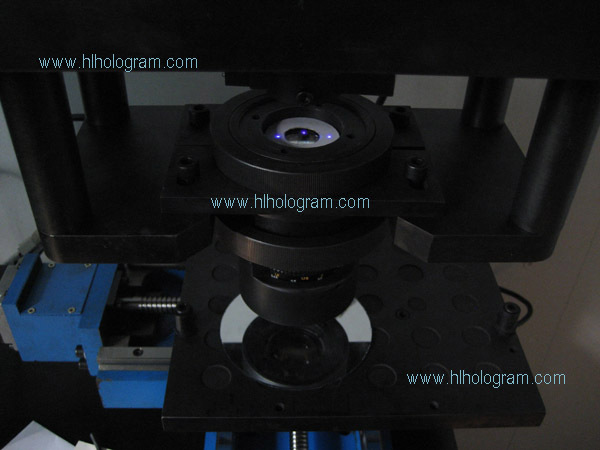 We produce and supply whole set equipment for hologram procution from design making to final application, include hologram mater originaiton shooting, electronic forming, hologram embossing, lamination and coating, cutting and hologram hot stamping transfering. 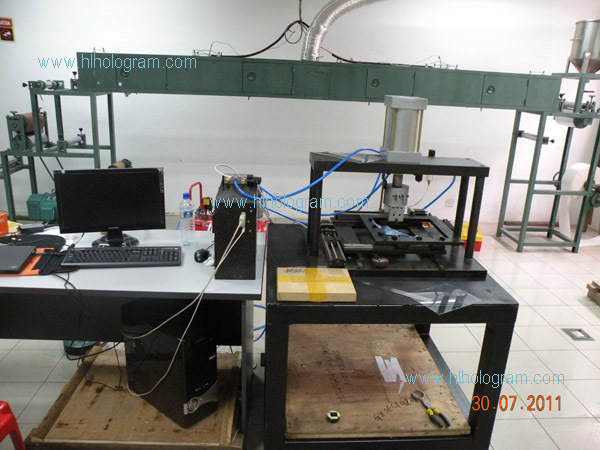 Our hologram machines produce hologram sticker, hologram hot stamping foil, transparent hologram overlay, scratch off hologram and wide web holographic packaging film. 2. 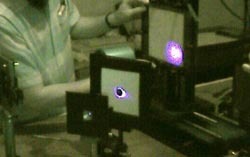 2D/3D Hologram Master Shooting Lab. 3. 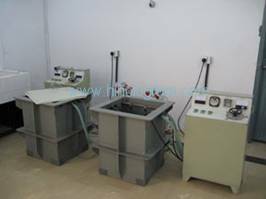 Recombination machine, recombination area 300mm*300mm. 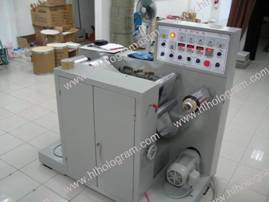 Hydraulic recombination machine with area 300mm*300mm. 6. 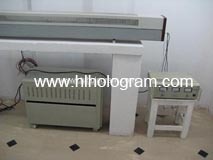 Coating & lamination machine for hologram sticker/ hologram hot stamping foil. 8. 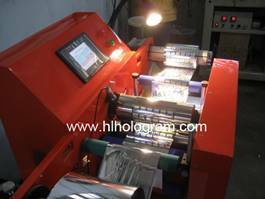 Application: Automatic label application machine or hot stmaping machine. 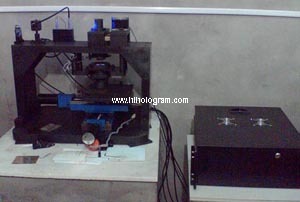 Dot-matrix master shooting machine in resolution(1270 DPI) Dot-matrix hologram master shooting system composed of optical, laser(15000 hours warranty), programmable controller, accurate platform, Optics bridge, computer and software. 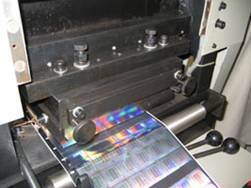 This system is intelligent engraving system. After you load engraving data which generated and optimized by our special software, it'll work automatic. 2D/3D mater shooting System new type, simple and easy to learn. With 2D/3D master shooting system, we can make 2D/3D, 2D, Flip-Flop, Microtext, Hidden Image, Special Effects, Animation. 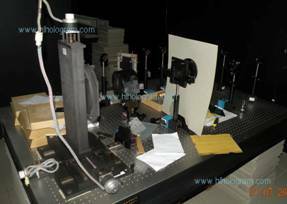 Main euipment required for 2D/3D holographic master shooting: Laser, X Y Stage, Optics, Optical table. 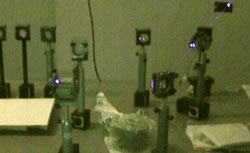 This is the photo of He-Cd laser which is in my training room. 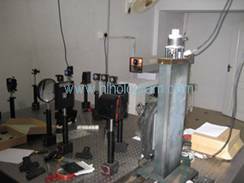 Helium Cadmium Laser power is 60mv -100mw, 441.6nm, with control unit and power supply There're Chinese made or Japanese made laser(Kimmon,Japan) available. The laser controller is automatic. The laser power meter check the laser beam parameters. 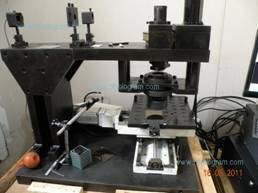 Microprocessor-Controlled Automatic Positioning Equipment is 3D process machine who control the master shooting according to the pre-setting parameter. It can control position, distance and depth of hologram will be shooted and how long time glass will be exposed to laser beam when shooting. X Y Automatic stage controller to set X Y position, movement distance, exposure time, pause time, etc. 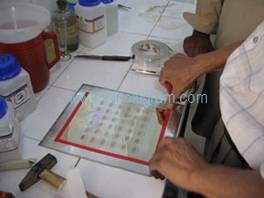 Optical Tables: 1200 x 1800 x 200mm, Metric M6 Holes, Isolated. Or equivalent. 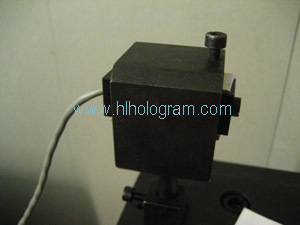 The vibration should be Isolated for holographic master shooting. 3. 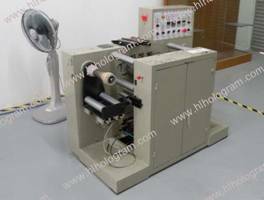 Small recombination machine up to size 250mm*250mm. 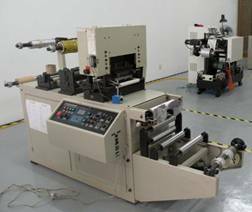 Small recombination machine to recombine small master up size to 220mm*220mm. 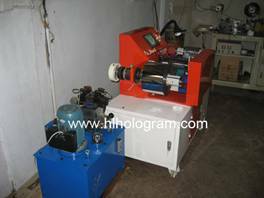 PC-Controlled, automatic and simple operation with high precision 0.05mm. 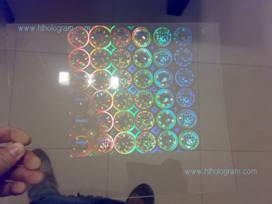 Hologram images recombined on plastic film. 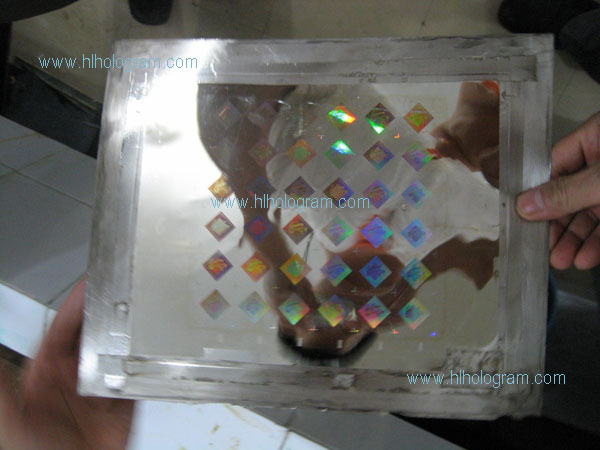 After silver coating of the film, we can make hologram master origination by electronic forming. 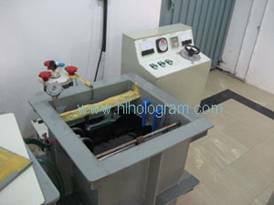 Electronic forming equipment. 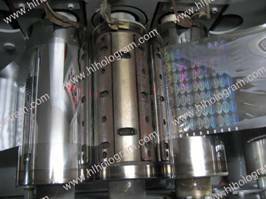 Soft and hard tank make hologram nickel master origination and operation nickel shim. 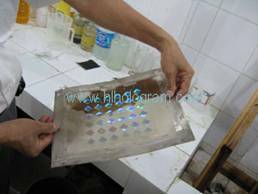 The aim of this electronic formation is to copy the hologram from photoresist glass which has hologram imaged recorded, hologram imaged recombined onto PE film, or provide enough quantity operation shims for the embossing machines. 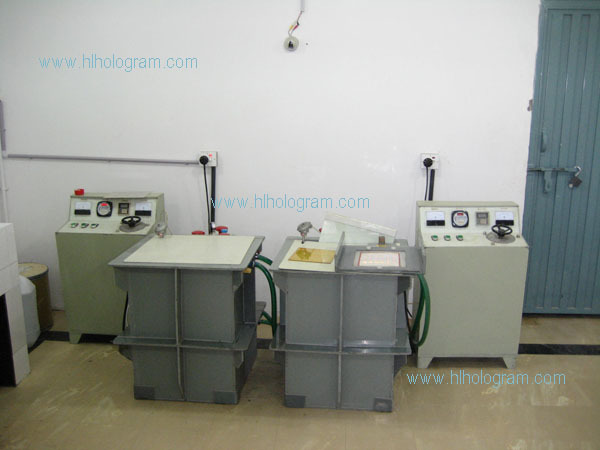 Hologram master origination is made by soft tank. 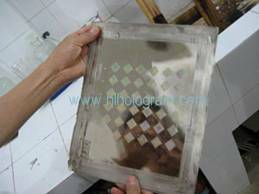 This nickel hologram shim is copied from photoresist. There's brown photoresist glue coating still on the surface of nickel shim. We have wash it away. 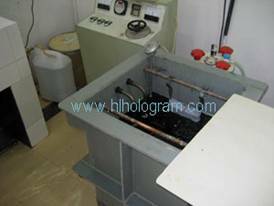 Small electronic tank is for duplicating small master which is used to emboss hologram sticker and big tank is duplicating big master which is used to produce hologram film. 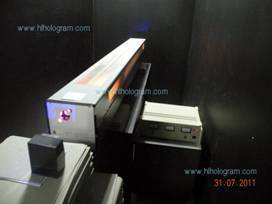 Narrow web hard hologram embosser is designed for producing 160MM width hologram products, such as hologram labels, narrow web hologram film, hologram aluminum foil, hot stamping foil, etc. 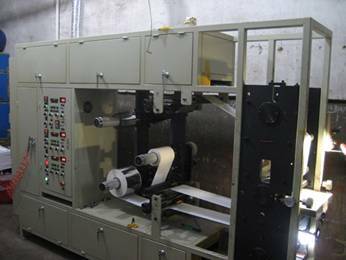 It consisted of three parts: embossing unit, heating system and control panel. 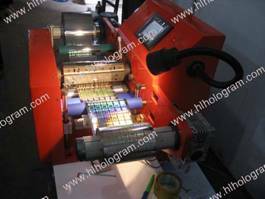 This hologram embosser makes embossing hologram roll in precise gap with any distance. 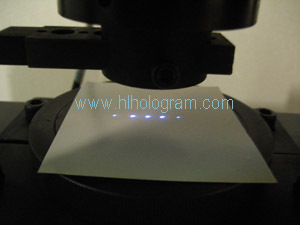 The hologram made by this embosser have precise gap. 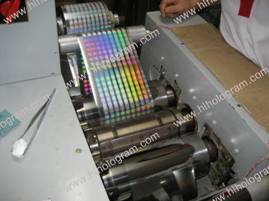 So the hologram sticker roll or hologram hot stamping foil is suitable for simple automatic application. 2. 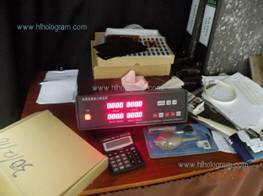 Intellectual temperature control, it is accurate in temperature control when embossing. 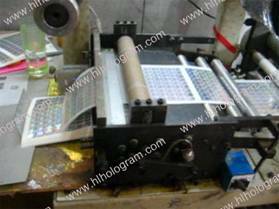 Model A automatic die-cutting machine is very good to die-cut hologram sticker precisely and fast. 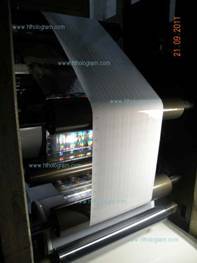 It has sheeting equipment which sheet hologram into panels automatic and slitter which can slit big hologram sticker roll into small rolls. 1. 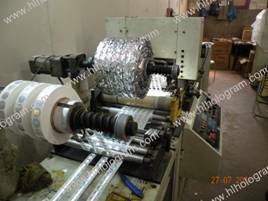 Automatic anti-deviation when unwinding foil. 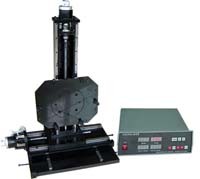 It can improve precision of unwind to decrease deviation in horizontal direction. 2. Intelligent photoelectricity location position ability. It can locate the right position of white register mark precisely. 4. Rotation ability of dit-cutting model. 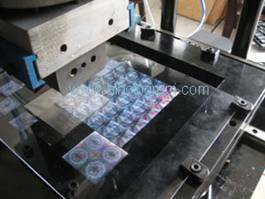 It can help to adjust model position precisely and can die-cut sticker in some special direction. 5. Rewind independently which imporove to rewind the waste film smoothly. 6. Two sets rewinder to help rewind small rolls after slitting smoothly. 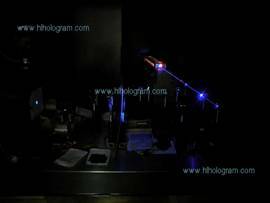 The making of a hologram can be divided into 2 procedures. 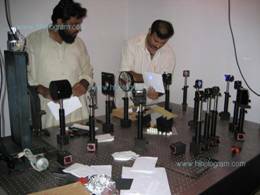 The making of a master hologram and the making of a reflection hologram. hey both have to be recorded in total darkness. 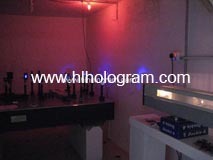 The recording of holograms is a process sensible to vibrations. Let's start with the recording of a master hologram. Master shooting System has two type. One is 2D/3D mater shooting System, another is Dot-matrix master shooting System. There're two type of 2D/3D master shooting. 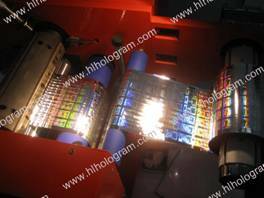 One way is to shoot master by H1 glass to make hologram text or image in background. 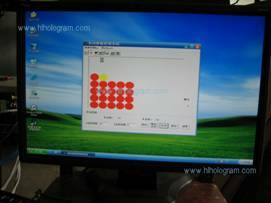 Another way is to shoot master by hologram image maker facility directly.To shoot master by hologram image maker facility directly, all forground image and background image can be shooted in same way(no need to make H1 glass for background first). It's much easily way than to make background by H1 glass. Master shooted by hologram image maker facility also is much shining and clearn without noise wrinkle than the master shooted in another way, especially, on big rainbow area. 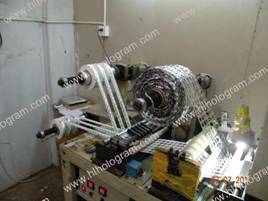 To shoot master by hologram image maker facility, we need automatic position localization equipment to locate record glass position precisely. 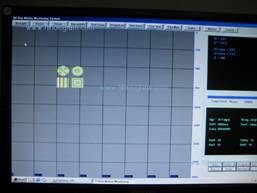 To shoot master by H1 for background, we have to control position platform manully. Two different 2D/3D master shooting, we need two different position localization equipment, one is manual positioning equipment , another is automatic positioning equipment. We have both type master shooting technology. 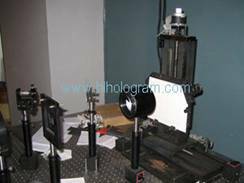 To shoot master by hologram image maker facility is suggested because it's easier to learn and quality of master made is better. 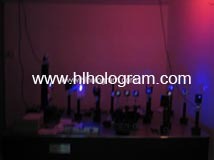 This is the photo of He-Cd laser which is in my training room. 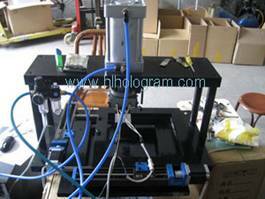 Microprocessor-Controlled Automatic Position Localization Equipment for 2D/3D, kinematic movement, flip-flop, hidden text, floating effect. The weight of whole System will be 300 kg. Dot-matrix master shooting machine in resolution(158 DPI, 317 DPI, 635 DPI, 1270 DPI) according to different customer's requirement., 2400 DPI also is available with customized mold. 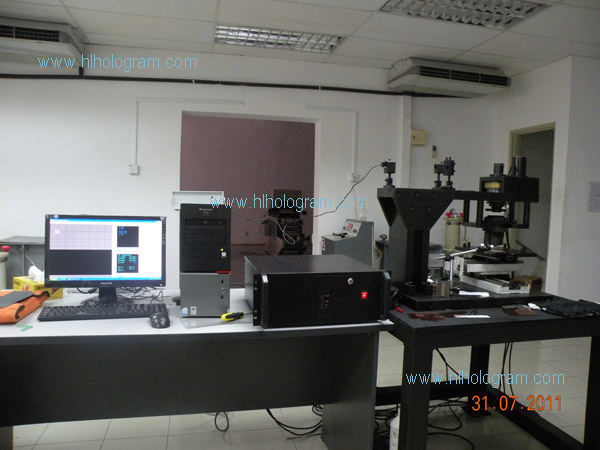 Dot-matrix holographic master shooting system composed of opetical tabel, He-Cd laser, programmable controller, acurate platform, Optics bridge, computer and software. This sytem is intelligentized engraving system. After you load engraving data in it'll work automatic untill finish the job.